When you look up at the night sky, you're seeing the long-ago light from distant stars. But how can you know how far away they really are? You can't exactly roll out a measuring tape. Luckily, there's a way you can fix the position of galaxies in space, using the Tully-Fisher relation. Astronomy has always struck me as an interesting subject for the casual reader, but a hellish one for the serious researcher. It yields a lot of data, but all of the data is so contingent on other data that it becomes a billion-piece, three-dimensional jigsaw puzzle that's all black with occasional white flecks in it. If I decide that one star is one thousand light-years away, and then see similar stars that are ten times fainter, I might fix the new ones at ten thousand light-years away, and feel pretty good about it. But if I realize that some of these new stars are fainter for some reason other than distance, I have to rethink those stars. If I discover my estimate of the distance to the first star is off, I have to re-do the entire thing. Astronomers are always dealing with so many possible variables, it's hard to understand why they know the distance to any stars at all. One way to collapse a few variables is by using the Tully-Fisher relation. It manages to link the brightness of a galaxy to the curve that the galaxy creates when it's spinning. Spiral galaxies are spirals because the inside of the galaxy is spinning fast, trailing out lagging galactic arms behind it. The more mass the galaxy has cramped into its packed center, the more dramatic the difference between how quickly stars orbit near its center, and how slowly they orbit around its edge. It makes for a dramatic curve, not just in the sky, but on graphs of the high rotational velocity of the quick inner stars that drop down in a curve to the low rotational velocity of the outer ones. But mass doesn't just determine rotation, it also determines brightness. The more stellar mass a galaxy has, the more stars are lit up, and the brighter it is. Distance might dim the brightness of the galaxy, but it doesn't hide the rotational curve. If scientists notice a dramatically spiraling galaxy that's extremely dim, they know that it's farther away than it appears. 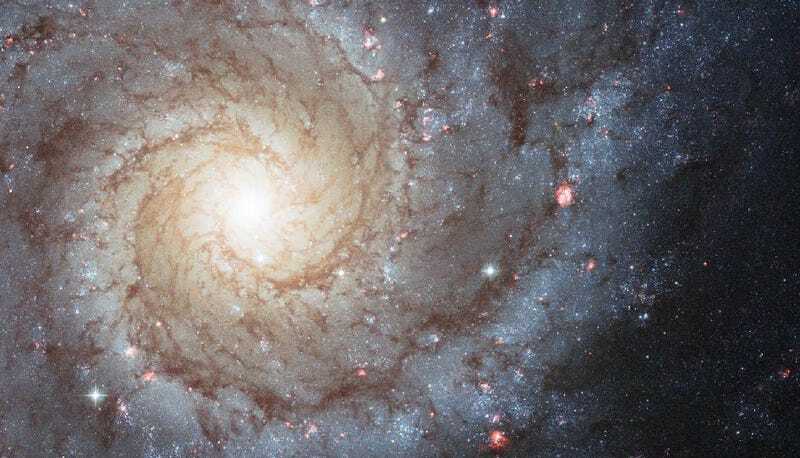 This relation between mass, curve, and brightness, has allowed scientists to calculate the distance to a lot of clusters of galaxies, fixing more points in the giant jigsaw puzzle. Unless it's somehow wrong, and they have to do it all over again. If so, good luck!